It is right and fitting that the British Empire set its watches using a load of old balls. It was the balls which, indirectly, enabled tiffin, and afternoon tea at four. Balls featured at the United States Naval Observatory, and have spread to New York, Sydney, Gdansk and Gothenburg. The balls are inextricably linked to the sun and the stars, and thus one finds many balls at observatories; and one lives at that grandaddy of them all, the Greenwich Observatory. The balls watch the stars, which march across the sky and tell the time for us mortals. They were used at ports to inform ships of the time, a bit like our BBC pips do these days. The sailors would look up at these huge brightly coloured spheres and watch them drop at 1pm every day. The mind boggles just thinking about it. And presently, the sixth Astronomer Royal, John Pond, decided it would be a capital idea to have a large red ball atop The Octagon Room at Greenwich overlooking the Thames, for the ships below, sailing up and down one of the world’s water super-highways. I can think of many visual representations of the arrival of a given time. Semaphore, perhaps. now-you-see-it-now-you-don’t arrangement. But naval man – firstly at Portsmouth – chose a pointed stick skewering a huge ball. It would rise from the bottom of the stick five minutes before 1pm, and come to rest half way up. With two or three minutes to go they were raised the whole way.And then at one, they would drop. And everyone on the nearby water would know, by the dropping of the ball, that it was one pm exactly. The pips took over in 1924 and the balls were rendered obsolete. 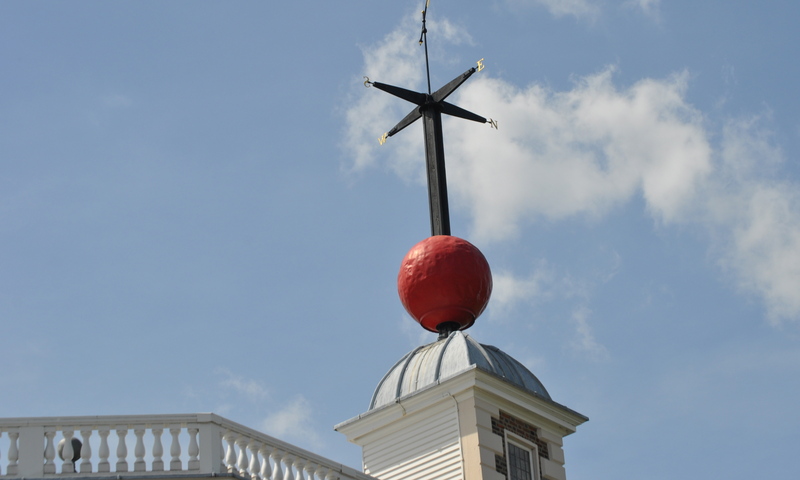 But at Greenwich, every day, at 1pm sharp, the ball drops once more. I wonder what Freud would have to say about the whole business. Posted in Quirks of HistoryTagged england, greenwich, history, observatory, time ballBookmark the permalink. I got to Freud about 8 lines in Kate. all this elevation and lowering got me giddy. We used to have a noonday gun (cannon shot) off Signal hill in Cape Town. I have a suspicion it’s been stopped. Sound not sight? Very effective, I would have thought, Sidey! We had a siren that went off at noon everyday in the small town I grew up in. No one would have been in any doubt as to the time, Steven! Dropping the ball has a lot to do with failed leadership too.One of those sports metaphors i.e. hitting a home run – getting that midnight kiss. Great post, Kate. An absolute ball! Much food for thought, as always, Kate. When I was a youngster, a siren would go off every evening at 6. I don’t know where it came from or if it still goes off, but, I learned when 6 o’clock was early on. We fall into the routine of these things, don’t we, Penny? Fantastic film. Grim sound though. Living so close to Broadmoor Hospital, we have one a little like it at 10am on Monday mornings. If I were ever in the forest and heard it at any other time, I would hare back home to a place of safety and lock the doors…. 😀 If you’re a tourist and miss it you have to wait until the next day! Hehe, dropping, like everything else in time 🙂 Entertaining, as always, Kate. In Sydney, a gun is fired on Pinchgut island at 1pm daily – I always feel a sense of childlike delight when I hear it. Sounds a lovely way to mark the passing of the hours, BB. I can’t think of anything in my daily experience quite like this ball or anything else that announces the time on a regular basis. Nada! I feel a little deprived. The balls are really unusual. Freud did a number on all of us…where the mind does go! I know. I’d love to ask some high-up naval official that. ‘A Signal Ball will be seen at the entrance to Reading Station when the Line is right for the Train to go in. If the Ball is not visible the Train must not pass it.’ ! Oooh, Martin, I’m not far away from Reading Station….I wonder if there are any old pictures of the ball? Thank you! An air raid siren was used by one small town factory to mark lunch time when I was young – it gave Blitz survivors the heebies. Sounded just like that one of lameadventures. Until 2010 there was a working time ball station in Lyttleton Harbour outside Christchurch New Zealand. Sadly it was damaged in the September 4th 2010 earthquake. At first repairs were possible and work started, but on February 22nd 2011 another massive earthquake struck and finished it off. It was a favourite building of mine and an icon of the township so sorely missed. There are fewer and fewer time ball stations left in the world these days … more’s the pity, because they really are amazing pieces of history. One day when I manage to visit London I would love to visit Greenwich and see this. Thanks!